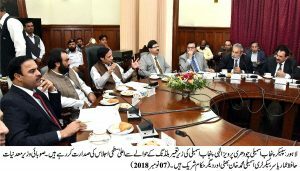 Lahore: 07-11-2018: Speaker Punjab Assembly Ch Parvez Elahi presided over a high-level meeting regarding under-construction Punjab Assembly building at the Assembly Chambers here today (Wednesday). The meeting was attended by Provincial Minerals Minister Hafiz Ammar Yasir, Chairman Planning and Development Board, Secretary Finance, Director General Parks and Horticultural Authority (PHA), Secretary Communication and Works, Principal National College of Arts (NCA), Secretary Assembly Muhammad Khan Bhatti, Senior Secretary Assembly Rai Mumtaz Hussain Babar and Director General Parliamentary Affairs Inayatullah Lak as well as officials of the Buildings Department, National College of Arts and NESPAK. He said this is a team work; all will be appreciated for constructing strong and grand building, special attention also be paid to arrangements for fool proof security in the construction.